Is your commercial business prone to leaks and water damage brought on by heavy Arizona rains? Are you in search of Scottsdale Commercial Foam roofing? 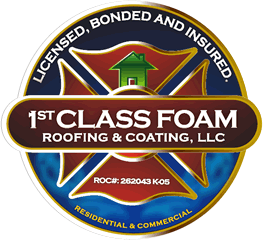 1st Class Foam Roofing & Coating is proud to offer their help. With many other services to offer, 1st Class Foam Roofing & Coating can provide you with the knowledge and experience to upgrade your roof to protect your business from the abundant rains that plague us during monsoon season. Don’t take a risk with your roof. Make sure it is guarded from the elements to better protect your commercial business. Owner Jason Rivers has over seventeen years of experience under his belt and he and his experienced professionals are dedicated to providing the highest quality Scottsdale Commercial Foam Roofing services just for you. There are many different kinds of roofing that are available for commercial businesses, but why not choose the best? Foam Roofing and coatings are your best option for safeguarding your business and protecting your livelihood. Sprayed Polyurethane foam roofing in Scottsdale is the best way to insulate your roof. It’s superior technology will meet your building’s code requirements and it will remain up to date for a long time to come. In addition to this, the foam roofing is a form of green energy construction, so you don’t have to worry about leaving a large carbon footprint for the world. An added benefit is the lack of maintenance it requires. The savings you will amass from this factor alone are tremendous. The foam roofing is durable and thick, and is guaranteed to last for up to 50 years. Providing excellent insulation and remaining 100% waterproof, this roofing should be your number one choice for your Scottsdale Commercial business. With 100% five star reviews on Yelp, your satisfaction with our friendly professionals is guaranteed. Our experts at 1st Class Foam Roofing & Coating are dedicated to providing the highest quality roofing services for their customers. Offering free roof evaluations with no obligations or attachments, we can inspect and determine what kind of roof is best suited for your Scottsdale Commercial business at no cost to you. Trust our professionals to give you the best services they can provide. With an A+ Rating on the Better Business Bureau and 100% five star reviews, you can rest assured that you are choosing the best Scottsdale Commercial Foam Roofing with 1st Class Foam Roofing & Coating. Our professionals are dedicated to giving you the highest standard of roofing, and your satisfaction is guaranteed. Whether repairing your leaky roof, or replacing it, 1st Class Foam Roofing & Coating can help you with any roofing project. Trust us to get the job done right the first time, every time. For more information about the other services and products we offer, contact us today and speak with a professional foam roofing contractor in Scottsdale.